As the raisins plump up in the warm Riesling and olive oil they absorb the sweet, fruity characteristic flavors of the liquid. If you slice the baby turnip thinly enough on a mandoline, there’s no need to peel it. Watch our video, "How to Use a Mandoline." Prepare a gas or charcoal grill to high (500°F to 600°F) heat. In a 1-quart saucepan over low heat bring the wine to a simmer. Remove from the heat and add the raisins and soak until plumped, about 5 minutes. Stir in 1/2 cup of the oil, the red pepper flakes, and salt and pepper to taste. Place the vegetables on a large rimmed baking sheet and brush them with the remaining 1/4 cup oil and season with salt and pepper. Transfer the vegetables to the grill and cook until grill marks form on both sides, about 6 minutes total for the zucchini and the squash, and about 12 minutes total for the onion. Transfer the vegetables, nuts, and turnips to a large bowl and toss. 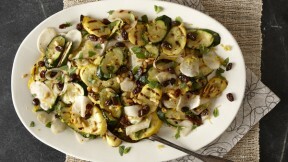 Dress the vegetables with enough of the raisin dressing to lightly coat and season to taste with salt and pepper. Transfer to a serving platter and garnish with the mint and lemon zest. Pass the leftover dressing at the table.